"A gathering of poetry at the intersection of culture, social justice, and the environment." Coordinated by Melissa Tuckey, Split This Rock's Eco-Justice Project seeks to amplify the voices of poets who are writing at the intersection of social justice and the environment and build community between activists and poets. The project revolves around the publication of Ghost Fishing: An Eco-Justice Poetry Anthology. It has been several years in the works and we are excited to announce the book is now available from University of Georgia Press! The Eco-Justice Project includes readings, workshops, and other events highlighting the connection between environmental concerns and social justice, embracing the rights of all people to equal access to a nature and a healthy, safe environment, and creating an opportunity for cross-cultural connection. Towards those ends, we are organizing a book tour, which will include a tour of environmental justice sites and opportunities for poets and activists to connect. If you are interested in organizing a reading, or workshop in your community, please contact Melissa Tuckey at ecojustice@splitthisrock.org. Celebrate the publication of Ghost Fishing: An Eco-Justice Poetry Anthology (University of Georgia Press) with renowned poet Ross Gay, anthology editor and Split This Rock co-founder Melissa Tuckey, and DC-area contributors Hayes Davis, Ailish Hopper, and Katy Richey. Bring your own eco-justice poem to read on an open mic after the features. A gathering of poetry at the intersection of culture, social justice, and the environment, Ghost Fishing is the first anthology to focus solely on poetry with an eco-justice bent. As a new addition to the field of nature poetry anthologies, which have historically lacked diversity, this book presents a rich terrain of contemporary environmental poetry with roots in many cultural traditions. This event is co-sponsored by Split This Rock and Busboys and Poets and presented as a By the People satellite event. Ross Gay was born in Youngstown, Ohio. He is the author of Catalog of Unabashed Gratitude (University of Pittsburgh Press, 2015), winner of the Kingsley Tufts Award and a finalist for the National Book Award and the National Books Critics Circle Award; Bringing the Shovel Down (University of Pittsburgh Press, 2011); and Against Which (Cavankerry Press, 2006). He is also the co-author of the chapbooks Lace and Pyrite: Letters from Two Gardens (with Aimee Nezhukumatathil) and River (with Richard Wehrenberg, Jr.). He currently teaches English at Indiana University, where he serves as Director of Creative Writing. Ross Gay featured at Split This Rock Festival in 2016. Hayes Davis’ first volume, Let Our Eyes Linger, was published by Poetry Mutual Press. His work has appeared in New England Review and other journals, and many anthologies. He was nominated for a Pushcart Prize in 2016 and 2017, and was a member of Cave Canem’s first cohort of fellows. Ailish Hopper grew up in Washington DC, and is the author of Bird in the Head (Center for Book Arts) and Dark~Sky Society (New Issues). Individual poems have appeared in APR, Harvard Review, Ploughshares, Poetry, and Tidal Basin Review, among others, and in addition to page poetry, she performed with the band, Heroes are Gang Leaders. The recipient of awards from the MD State Arts Council, MacDowell Colony, and Yaddo, she lives in Baltimore. Katy Richey’s work has appeared in Rattle, Cincinnati Review, RHINO, The Offing and other journals. She has received fellowships from Bread Loaf Writers’ Conference, Callaloo Creative Writing Workshops and The Cave Canem Foundation. She hosts the Sunday Kind of Love reading series open mic at Busboys and Poets in Washington DC, sponsored by Split This Rock and is a member of the Black Ladies Brunch Collective. 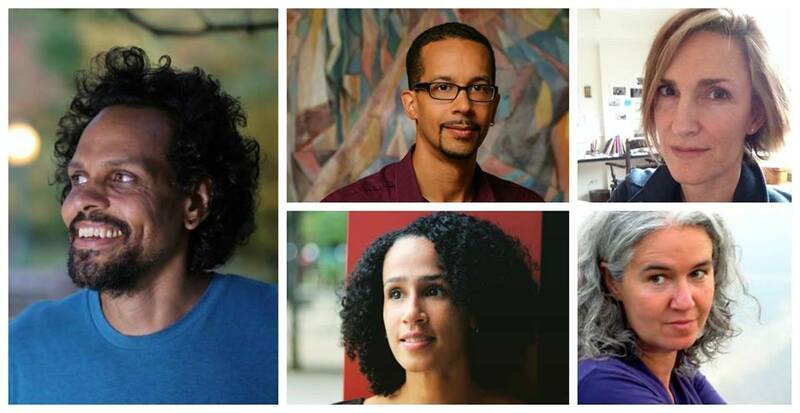 FEATURING: Craig Santos Perez ♦ Rigoberto González ♦ Yusef Komunyakaa ♦ Adrienne Rich ♦ Ross Gay ♦ Allison Hedge Coke ♦ Linda Hogan ♦ June Jordan ♦ Lucille Clifton ♦ Camille T. Dungy ♦ Martín Espada ♦ Margaret Walker and many others! 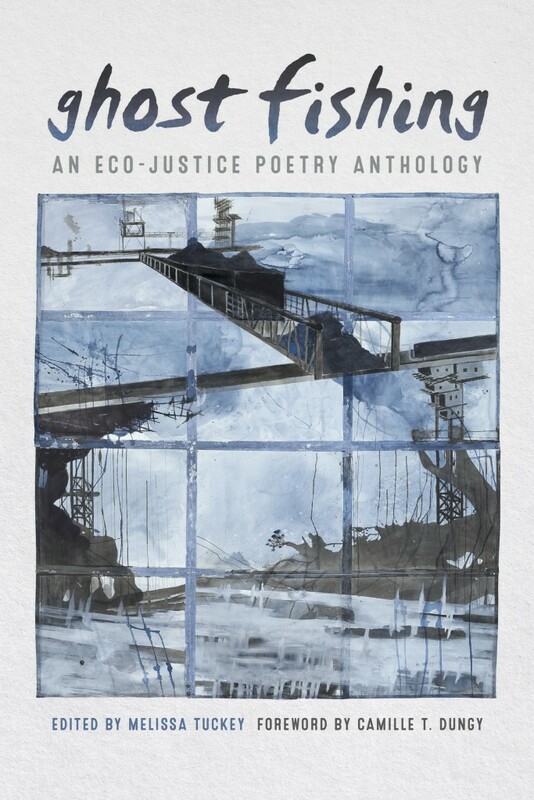 From University of Georgia Press: "Ghost Fishing is the first anthology to focus solely on poetry with an eco-justice bent. A culturally diverse collection entering a field where nature poetry anthologies have historically lacked diversity, this book presents a rich terrain of contemporary environmental poetry with roots in many cultural traditions. Ghost Fishing is arranged by topic at key intersections between social justice and the environment such as exile, migration and dispossession; war; food production; human relations to the animal world; natural resources and extraction; environmental disaster; and cultural resilience and resistance. This anthology seeks to expand our consciousness about the interrelated nature of our experiences and act as a starting point for conversation about the current state of our environment". 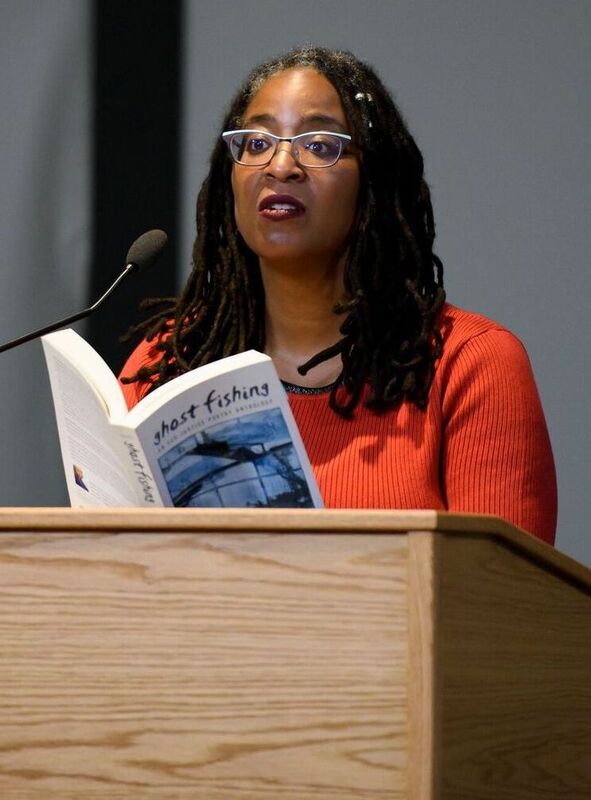 Pictured right: Camille T. Dungy reading during the Ghost Fishing Book Launch at 2018 Split This Rock Poetry Festival. Photo by Kristin Adair. The project's goal is to help build capacity for transformative change by giving voice to some of the most pressing issues of our times, embracing the complexity of the challenges we face, and creating space for imagination. Readings from the anthology aim to spark conversation on the ways in which diverse topics such as race, and class, and gender intersect with environmental concerns. Through writing workshops and other interactive activities, community members will be invited to engage their concerns in a creative way in hopes that the exchange will feed both activist and artist and plant the seeds for further collaboration. 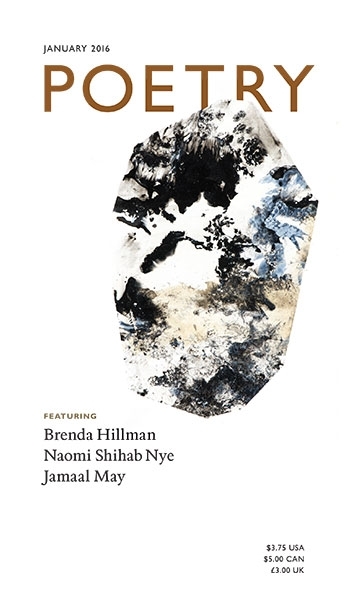 "In collecting poems for the anthology, I’ve learned to fully appreciate the role of culture in connecting us to the environment, as well as the historic way that colonization, war, white supremacy, and other forms of dispossession have robbed generations of their cultural connection to the land; poetry and other arts have served throughout as a form of resistance, an act of resurgence, and cultural memory." Read the full introduction and selected poems from the anthology at Poetry Foundation. Melissa Tuckey is a poet, editor, and literary activist. She’s a co-founder of Split This Rock, where she currently serves as eco-justice poetry project coordinator. She’s editor of Ghost Fishing: An Eco-Justice Poetry Anthology, forthcoming with University of Georgia Press in March of 2018. Tenuous Chapel, her book of poems, was selected by Charles Simic for the ABZ First Book Award in 2013. Other honors include a Black Earth Institute fellowship and a winter fellowship at Fine Arts Work Center in Provincetown. Her poems have been anthologized in DC Poets Against the War anthology, Ecopoetry, Fire and Ink: Social Action Writing and most recently in Truth to Power and recent work has appeared in Interdisciplinary Studies in Literature and the Environment, Cutthroat, Kenyon Review, and Missouri Review. Melissa lives in Ithaca, New York. The Eco-Justice Project is seeking an intern for Summer 2018! Working remotely is a possibility. If you are interested in applying, please send a resume and cover letter to Melissa Tuckey at ecojustice@splitthisrock.org.